Filipino cuisine is still in its nascent stages in LA, but one of the places that's helping the cause is the new-ish Belly & Snout in Koreatown. 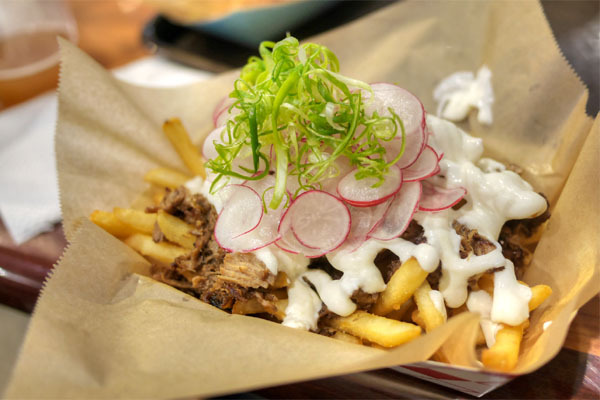 Named after the primary parts of the pig used in their sisig, the restaurant aims to mesh Filipino flavors with staples of American fast food, and is the work of former Discussion Truck operator Warren Almeda. About the Chef: Almeda underwent his training at the California Culinary Academy in San Francisco. After graduating, he worked briefly in the City before taking on a line cook gig at the W Hotel in Westwood. Next were positions at Roy's in both Woodland Hills and Las Vegas, followed by a stint at Asian fusion eatery Social House, also in Vegas. In mid-2008, Almeda moved to San Diego and started working at the Roy's in La Jolla, and after two years there, became executive sushi chef at the nearby Roppongi. However, he ended up relocating to Long Beach in February 2012, and subsequently teamed up with brother Bryan to launch The Discussion Truck that April. 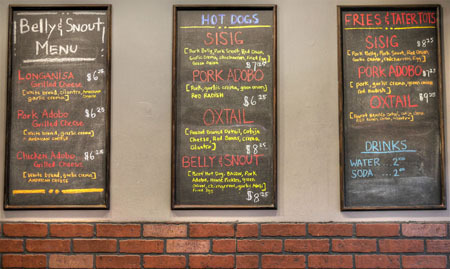 The food truck served as a test bed for the Belly & Snout menu, and lasted for about a year before closing in March 2013. After the shutter, Almeda worked at Blue C Sushi in Hollywood (where he met his current sous chef Ian Aquino), and apparently spent time with Ludo Lefebvre and Danny Elmaleh as well before debuting Belly & Snout in September last year. Belly & Snout takes over the space previously home to Singaporean joint Grainivore and Venezuelan eatery Amazonas. Ordering is done at the counter in front, while food is delivered through a small window to the dining area out back. The menu's simple enough: a set of core proteins (oxtail, sisig, adobo) offered in grilled cheese, hot dog, fries, or Tot formats. And to drink? Not much. Click for a larger version. 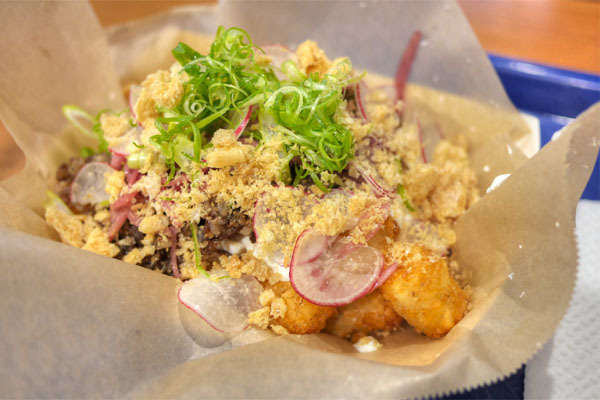 Sisig demonstrated a mix of crispy and supple textures, along with a heady, porky savor that was evened out by the brightness of the veggies up top. The crema did a nice job bringing it all together, and the Tots didn't let me down either with their simple, satisfying nature. Yum. The layout of the place makes it easy to slip in your own bottles for BYOB purposes. 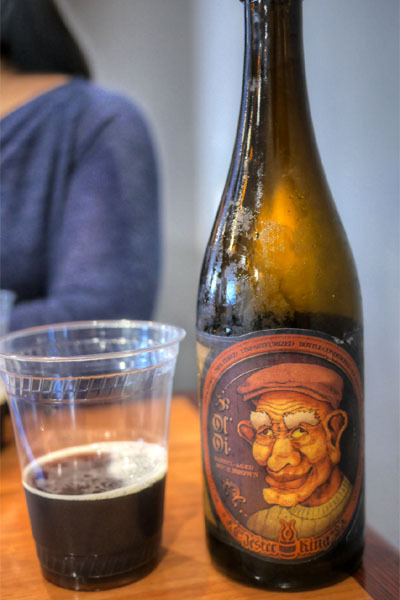 Our first beer was the 2015 Jester King Ol' Oi, an oak barrel-aged sour brown. I rather liked this one, with its tart, vinous, oaky qualities making for a good impression of an old school Flanders ale. 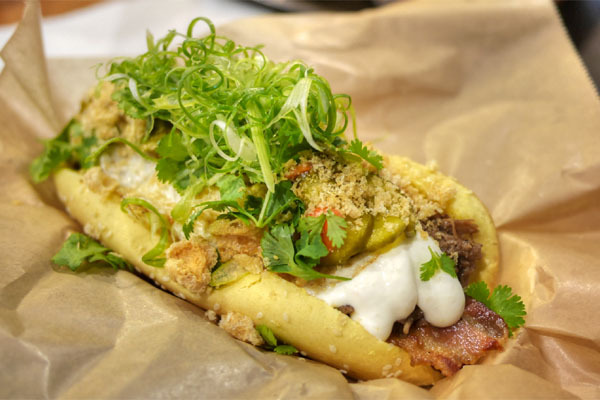 The signature hot dog hit the mark, the classic flavors of the beef link augmented by the combo of bacon and adobo while egg and aioli added further richness to the mix. Given the heft of the various elements, the zip of the accompanying pickles, cilantro, and scallion was certainly appreciated. 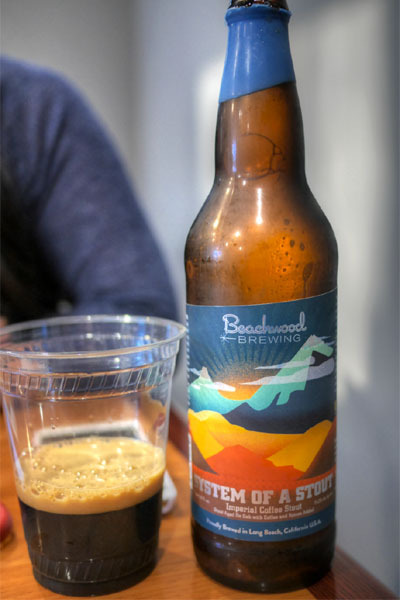 Released recently on June 6th, the 2015 Beachwood System of a Stout is arguably the brewery's most well-regarded beer, an imperial stout aged on oak with Portola coffee, cardamom, and molasses. The beer is meant to evoke an Armenian-style coffee, and it did a wonderful job at it. In fact, it was one of the most coffee-forward beers I've had, with massive quantities of super roasty, bitter coffee set against an undercurrent of aromatic spice. Almeda's longanisa features pork shoulder, pork fat, smoked paprika, sea salt, sugar, and garlic, and made for one of the highlights of the meal. 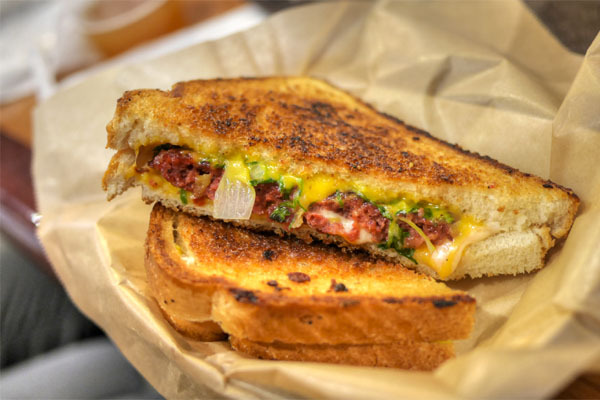 I was a big fan of the sausage's savory, yet slightly sweet flavor profile, and how that worked with the cilantro, the cheese adding a salty, creamy, gooey finish to it all. 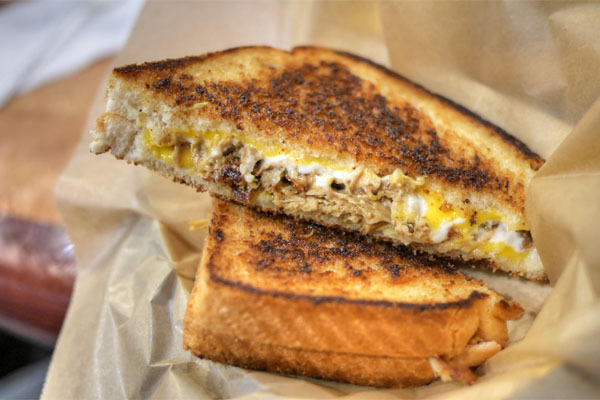 Certainly, one of the best grilled cheese sandwiches I've had. 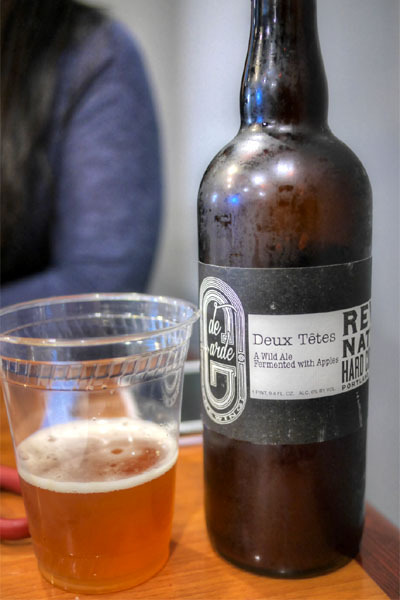 Next to imbibe was the 2014 De Garde Deux Tetes, a wild ale fermented with apples that was made in collaboration with Reverend Nat's Hard Cider from Portland. On the nose I got the funky, tart, earthy, spicy notes that you'd expect. The taste, however, was much more unexpected, with a "toasted sesame seed"-esque nuttiness overarching the otherwise sour, subtly apple-y nuances present. The adobo was richly flavored, the tender shards of pork enrobed by the lushness of crema while onions and radish imparted the necessary lightness. Nice texture on those fries as well, which served as a fitting base to the dish. 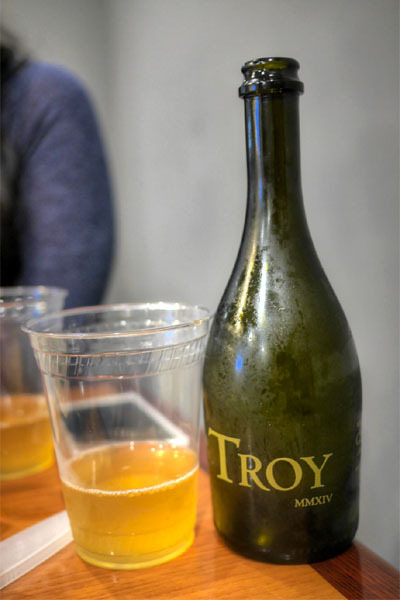 Moving away from beer for a moment, the Troy MMXIV was an apple and pineapple quince cider, aged in oak barrels for nine months. Weak nose on this one, though the palate definitely veered dry, acerbic, and tart, with the aromatics of the quince peeking through. 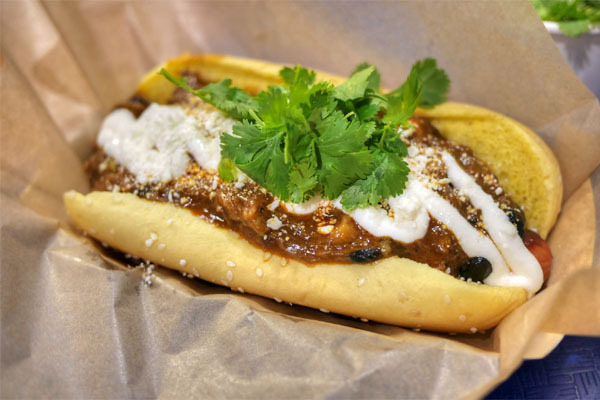 Belly & Snout's take on the chili dog was as good as any I've had, the snappy, savory frank taken up a notch by the deep, beefy flavors of kare kare-inspired oxtail. 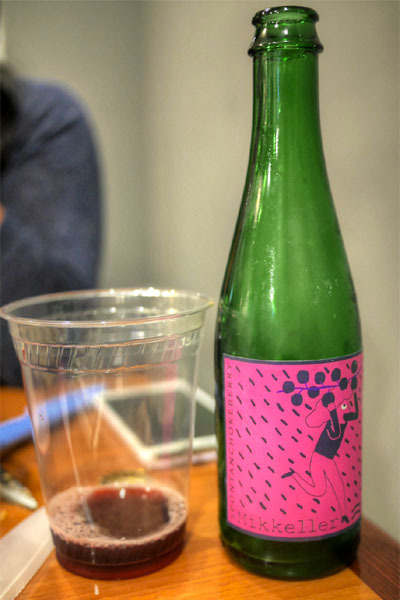 I was pleasantly surprised with the 2015 Mikkeller Spontanchokeberry. Tart, fruity, a bit metallic to the smell; tastes of tart, jammy berry commingled with a bright acidity and hint of wood. Not bad. The chicken adobo conveyed a straightforward savor that wasn't quite as interesting as the other proteins here, though it did work well enough when paired with the lusciousness of crema and cheese. 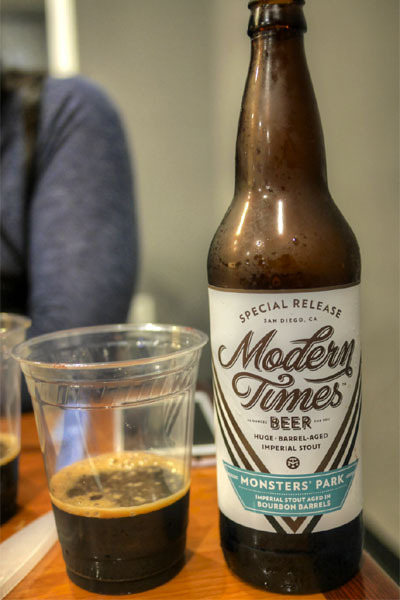 After consuming the coffee and coconut/cacao variants recently, we finished off the set with the 2015 Modern Times Monsters' Park Aged in Bourbon Barrels. Surprisingly, I didn't get that much in terms of aroma here, with a slight barrel character from the five-plus months spent in Heaven Hill casks. However, in terms of taste, this was one of the best BA stouts I've had in a while, with a huge chocolate-y presence and lots of sweet vanilla-laced malt and roast, underpinned by booze, making for a super well-integrated set of flavors that left we wanting more. 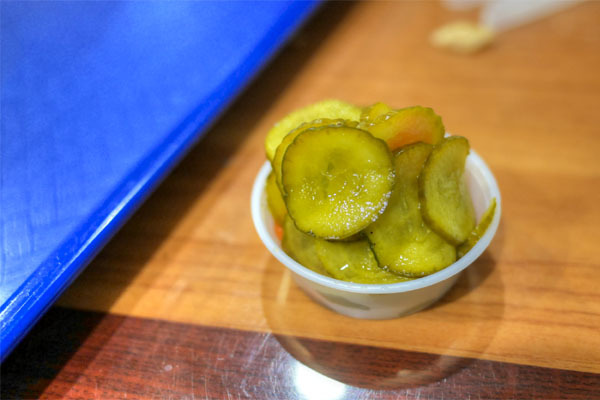 Complementary pickles were sweeter than expected. Our final bottle was the 2013 The Bruery Melange No. 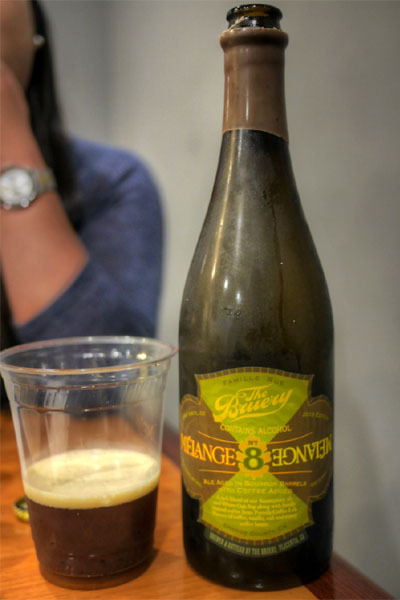 8, a blend of BBA Anniversary ale, BBA White Oak Sap, and Portola coffee that I believe was one of the original Hoarders-exclusive beers. I got a lot of that rich, boozy dark fruit and brown sugar character that you'd expect from a Bruery old ale here, with the coffee providing an astringency and bitterness that enrobed the entire beer. Chef Almeda was kind enough to provide us with an off-menu dish of arroz caldo. 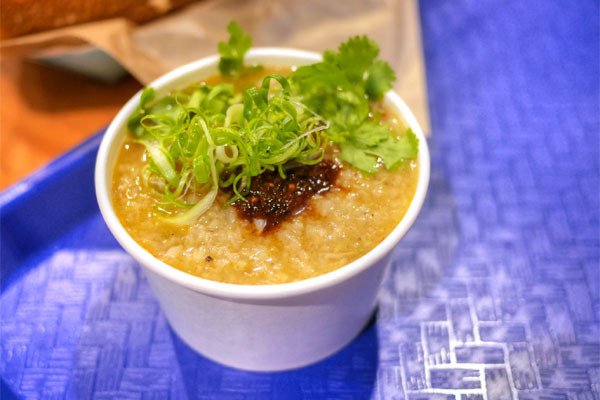 An adaptation of Chinese congee, it was a deeply comforting, deeply satisfying soup, with a cozy sort of savor to it joined by a delightful backbone of spice and heat. Definitely good enough to go on the menu. 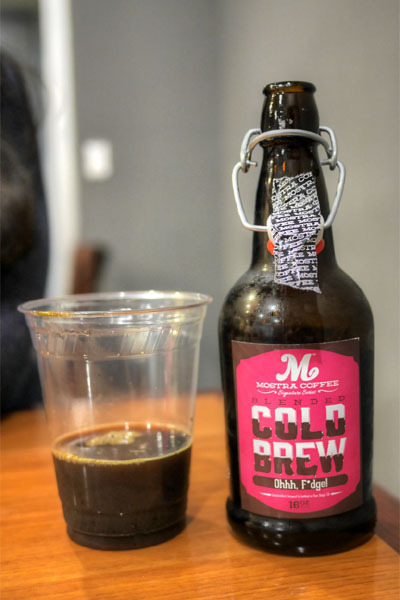 Finishing things off was a bottle of Mostra Coffee Cold Brew Ohhh F*dge. I'm not a huge coffee drinker, but quite liked this. You got the expected bitterness, the aromatics up front, but the close was all about a chocolate-y goodness that really did recall fudge. Belly & Snout delivered pretty much exactly what it advertised: a mash-up of Filipino classics and fast food that hit the spot. Next, I'd like to see Almeda get a little more refined, a little more traditional with his cooking, to bring us O.G. food with a modern edge, a Filipino version of Night+Market if you will. I think we're all waiting for someone to bring Filipino cuisine to the forefront of the LA dining scene, so why not him? 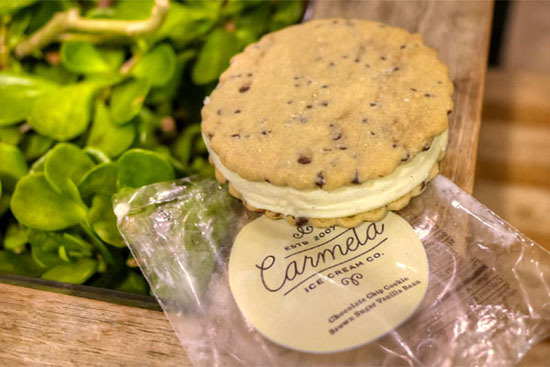 Given that Belly & Snout doesn't do the sweet stuff, we headed over to Carmela Ice Cream Co to satisfy our dessert fix. 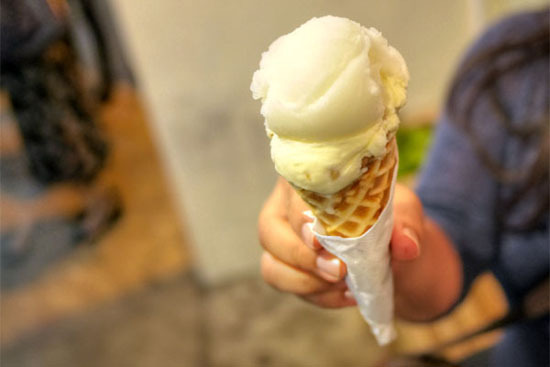 Items sampled included scoops of Lemon Verbena Vanilla Bean and Rosemary with Toasted Pine Nuts, as well as a Chocolate Chip Cookie Brown Sugar Vanilla Bean ice cream sandwich. It is astonishing that you wouldn't take proper glassware for that quality beer. To drink those beers out of plastic glasses is a waste of money, and beer. This is not the first time I've seen this. @Anon1: Shaming Kevin because he didn't bring fragile tulip glasses to a K-town joint that serves hot dogs and tater tots? LOL. This wasn't the first time you saw plastic cups because glassware doesn't exactly lend itself to clandestine BYOB-ing. A good number of those bottles were mine, and believe me, that beer was not wasted. Get over yourself. @anonymous Good Lord you must be an annoying little chore to hang out with, Guys like you who have JUST enough information about something to think they're a connoisseur. This is not the first time I've seen this.